Washington (CNN) - Thursday's landmark Supreme Court decision upholding the country's health care law appears to have had exactly zero impact on the presidential election so far, and has produced virtually no change in opinions on President Barack Obama or Republican challenger Mitt Romney, according to a new national poll. And while the CNN/ORC International survey released Monday indicates the president with a very slight three point edge over Romney among registered voters nationwide, the presumptive GOP nominee appears to hold an eight point advantage among voters who live in the 15 states considered in play in the race for the White House. But according to the poll, which was conducted in the four days following the high court's health care ruling, there's been a surge in enthusiasm by Democrats nationwide, and registered voters say that Obama would handle health care better than Romney. In a general election showdown between the president and the presumptive GOP nominee, 49% of registered voters nationwide say that if the November election were held today, they would vote for Obama, with 46% saying they'd vote for Romney. The president's three point edge is within the poll's sampling error. The results are identical to the numbers from the last CNN poll, conducted in late May. Obama's job approval rating in the White House, now at 51% (with 47% saying they disapprove), is virtually unchanged from the 52% he scored in our last poll, and the same is true of his personal favorability rating, which stands at 55%, with 45% saying they hold a negative view of the president. Romney's favorable rating, now at 48%, is also unchanged. Forty-two percent say they hold an unfavorable view of the former Massachusetts governor, who is making his second bid for the presidency. About a third of all Americans live in states that are not considered safe Republican or safe Democratic strongholds, including toss-ups states (like Florida and Ohio) as well as states that lean toward one presidential candidate but could ultimately wind up voting for his rival. In those 15 "battleground states," the poll indicates that Romney currently has a 51%-43% advantage over the president among registered voters, if the election were held today. "Note carefully that this does not mean that Romney will win each of those states by eight points, or that he will win all 15 of those states," says CNN Polling Director Keating Holland. "That's both good news and bad news for Romney. The good news: he has residual strength in states that the two campaigns are fighting over. The bad news: Romney is also spending resources defending states that should be part of the GOP coalition, rather than taking the battle to Obama's home turf." The survey indicates that Romney clearly has a big advantage in some of those 15 states, but the data does not indicate which states he is currently winning or how big that advantage may actually be. Neither candidate needs to win all 15 of those states in order to win the general election, so the aggregate results from all 15 states do not forecast an Obama loss or a Romney victory. The survey indicates the real effect of the Supreme Court's health care ruling may be in motivating voters rather than changing their minds, and the poll indicates that Democrats, for the moment, may be a bit more eager to vote than Republicans. Fifty-nine percent of registered voters who describe themselves as Democrats say they are extremely or very enthusiastic about voting this year, up from 46% in March. Fifty-one percent of registered voters who call themselves Republicans are extremely or very enthusiastic about voting, unchanged since the spring. Also working in the Democrats' favor: Registered voters say that Obama would handle health care better than Romney by a 51%-44% margin. More than half of those questioned say the high court's ruling will not impact their vote for president. But three in ten say that the court's decision will make them less likely to vote for Obama. "But more than half of those respondents are conservative and nearly nine in ten say they were already planning to vote for Romney. The same is true of the 16% who say that the court's decision makes them more likely to vote for Obama - more than nine in ten are already in Obama's camp," says Holland. "So the court's decision seems to have hardened existing opinions rather than changing them, making the fight for the dwindling crop of persuadable voters all the more important." In any case, the election will not be held tomorrow - and one in five registered voters say they may change their minds between now and November. The CNN poll was conducted by ORC International, from June 28-July 1, with 1,517 adults nationwide, including 1,390 registered voters across the country, and 534 registered voters in 15 "battleground" states, questioned by telephone. The survey's overall sampling error is plus or minus 2.5 percentage points. I love the way Democrats are so smart and know it all, even Obamacare yet these are the same people who over and over again keep writing that Romney got out of serving in the military showing that Democrats don't know that President Bill Clinton got out of going to Vietnam in 1968 through a political influence who was the US Senator Clinton was an aid to and then he said he would join the ROTC and he didn't. So why should anyone listen to Democrats that this Obamacare is really good for us when you are clueless of Democrat history? The more people begin to realize the positive impact Obamacare will have on their lives and how much the GOP has lied to them about it, there will be movement to the president. The GOP says it is a tax on the American people are perpetrating a lie. It is a penalty, or tax, or punishment, or whatever you want to call it on the freeloaders of the system who don't want to purchase even the most basic health insurance and would rather use the ER for primary care. The closing of the doughnut hole for seniors on perscription drugs, coverage on preventative care, no cap on what can be paid out over the life of a policy meaning that a catostophic illness or accident will no longer take everything you own. You can get coverage when you have a preexisting condition, parents with children that are born with health complications can rest easier knowing their children cannot be denied health care because the insurance companies determine it to be a preexisting condition. Children are already allowed to be on their parents insurance until age 26, to which many say Thank God. Doctors say that Obamacare is a very good start and that the health insurance companies will no longer be between them and their patients, hospitals say it will help them cut costs. Overall, all of the components involved think it is a very good start to helping the solve the healthcare crisis in America. The only people against it are the Republicans and their mouth pieces. So now the GOP wants to repeal and replace, except they never say replace with what. If there is a part they don't like, perhaps they should try to change that part and not muck everything up for the American people. Oh, and by the way to the seniors like me, the statement that there are cuts to Medicare are only in a slight decrease in what is paid to doctors and hospitals, it will not affect you in any way./ And to those out there that say what if my employer drops health insurance coverage. Companies offer insurance company as a benefit to get higher quality and higher educated help, to fill jobs. Why would that change? In actuality, businesses will be able to take advantage of the insurance exchanges to bring prices down. Obamacare is a huge step forward for affordable healthcare for all Americans. I don't know where this person got their poll numbers. The President is actually beating Romney in 50-42 in swing states. President beats Romney 47-38 Ohio, 45-39 Pennsylvania and the closest 45-41 Florida. So again I say don't know where this writer got is numbers...Oh by the way this information is from Fox news. Nelson Colorado...are you that uninformed? Democrats had control of both the house and senate when Obamacare was passed. When looking at numbers as far as spending, the Obama administration has not spent even close to the amount republican's have but they (republican's) keep blaming the Democrat's. The republican's in the white house are some of the most heartless people that exist on earth. Not the regular people that vote republican. I know the democrat's are not the best but a step better then republican's. The white house republican's do not care about your health and poison the water, food, and air you breathe while sitting back and claiming to be Christian's so people will vote for them. 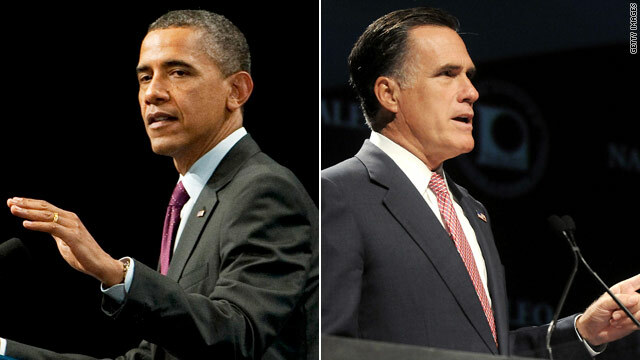 obama is likely to win but a debate featuring obama,romney,johnson and stein makes good since to me! Romney and the repubs dont care about the Middle class and Poor Americans. Romney only cares about his wealthly buddies. America! this is the time to look for lasting solutions..... It is a witch hunt to say I will repeal OBOMACARE.... I am sure there is something good about this law that works. Stop demonstrating the race card... and look for ways to improve it where it law is weak. Collabrate to resolve issue and stop the self center politics... America politics should be matured in this way. obama is setting up to lose by the biggest margin in America's history!